Note: A tribute to St. Patrick’s Day. This review by Mark Probst originally appeared in Speak its Name, April 15, 2009. Story blurb: Two Irish Lads is a pioneer story with a difference. It is at once a carefully-researched depiction of pioneer life in the early part of the nineteenth century, and also a love story of two men who might have lived during such a challenging time. Sean and Patrick McConaghy are two young cousins who set sail from Ireland one St. Patrick’s Day in 1820, and after a long and eventful crossing of the Atlantic, they tackle the mighty St. Lawrence River with a band of rugged voyageurs to eventually settle in the wilderness of Upper Canada. Here they are not only confronted by the daunting task of carving a homestead out of the vast primeval forest, but also the ever-present danger of living as a devoted couple in a world where the possibilities of humiliation and death stalked them at every turn if their secret should ever be discovered. It is a tale that also encompasses mystery, tragedy, brawling, humour and pathos, and altogether it will have you turning pages to discover what is about to happen next. About the author: Gerry Burnie is a dedicated Canadian author, best known for his historical fictions, Two Irish Lads, and Nor All Thy Tears: Journey to Big Sky. Now retired, he has had a long and varied career. For twenty-five years prior to his retirement, he lectured on the topics of political science and law, and then turned his interest to history for a further five years. In addition, he has been an actor, singer, dancer, artist and a municipal politician at various times in his life. 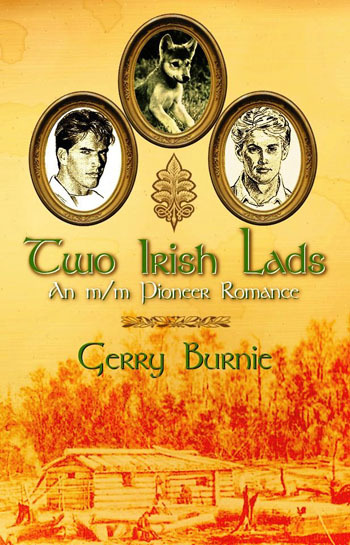 Gerry Burnie’s Two Irish Lads is a quaint tale of second cousins Sean and Patrick McConaghy who migrate to Canada from their homeland of Ireland in the year 1820. With their life’s savings they intended to buy some land in “upper Canada” (the area now known as Ontario) and make a good life as farmers with the hope of prosperity. Once they arrive they visit the land office and select a choice piece of property. With a few supplies and a tent, they take on the task of clearing the land, hoping to build a shelter before winter. The two lads eventually realize they are in love. One of the settlement’s wealthy leaders, Nealon, takes them under his wing, giving them advice, arranging a cabin-raising for them, and even getting Sean a job as a schoolmaster. It is soon revealed that he has an ulterior motive in that he hopes they might marry his two daughters. There are a few harsh realities through which they must persevere, before all the dust settles, but I won’t spoil it by revealing any more. The story is written in the style of Sean’s daily journal. While the first few chapters do indeed read like an authentic journal, thankfully Burnie then shifts to more of a first-person narrative than how a real journal would read, but that is simply to accommodate the storytelling process. Burnie’s knowledge and research shine through in that the story beautifully describes 19th century Irish customs and decorum. He even uses a few Gaelic phrases, always with translation, and the dialog sounds so right you can practically hear the Irish brogue. I thought the characters were well-developed and exuded a great deal of charm. Sean was the leader and sensible one, whereas the younger Patrick was more carefree and daring. While he yearned to be able to be open and proclaim his “secret love” to the world, he deferred to Sean’s wisdom and together they balanced each other out. The details of frontier life were also well researched, and the descriptions were vivid enough to give us a good picture of the landscapes and the settlements. My quibbles are minor – I’d have liked to see more of Sean actually teaching the children, and I felt there were a few times some of the characters were just a little too perky for my taste. I really enjoyed Two Irish Lads. It suits my personal taste of an upbeat depiction of frontier life, and I especially like stories where people come together to help each other and fight against the evils that threaten them. I look forward to reading more from this gifted author.